Three senior citizens were among community members, who celebrat­ed history, as they can now access tap water. In Yako, outside Nadi Town yesterday, members of the community danced and celebrated with joy the historic moment of their lives as the Minister for Local Govern­ment, Housing, Community Development, Infrastructure and Transport Parveen Ku­mar Bala officiated at the opening of the Yako Temple and Seaside Main Extension Project. Govind Sami Reddy, 84, who was born in Chennai, India in 1936 first settled at Tagi­tagi, Tavua. He and his family moved to Yako seaside in 1966 to settle in a sugarcane farm. “Those days we had wells and when it gets too salty I had to go to town and fetch our water,” he said. Lila Wati, 75, who got married in Yako came from Navau, Ba. Over the years she had to endure the hard­ship of getting water from wells. “When I came to this area there was no tap and it was had fetching water from the well using buckets, which was a norm here,” she said. Durgamma, 84, shared similar sentiments. “It is a grand occasion today. Tap with run­ning water at last. We are grateful for these developments,” she said. In his address Mr Bala said piped water was at a critical level in 2006. “The Prime Minister then made sure that water, which is a basic necessity and tap water, must be accessible to all Fijians,” Mr Bala said. The $1,430,000 Yako project will benefit nearly 100 households and temple or about 600 people. 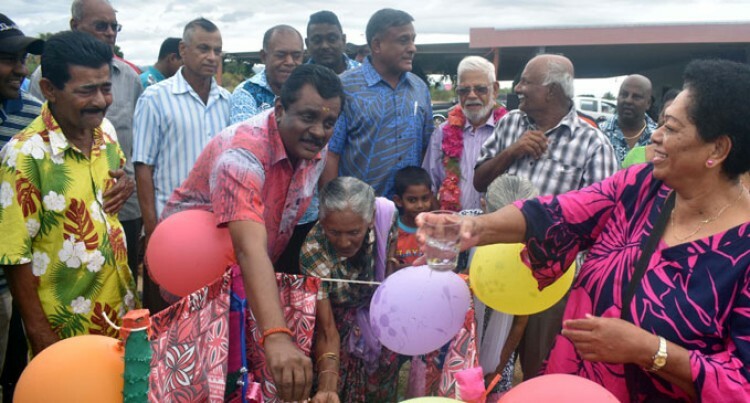 Meanwhile, the minister also officiated the Nalovo Main Extension Project outside Nadi which is connected 2.5 kilometres from the main pipe.